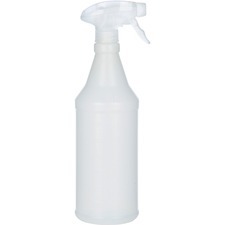 Empty, plastic spray bottle features a trigger-type atomizer cap and flexible plastic tube that is ideal for dispensing cleaners. Chemical-resistant trigger sprayer is adjustable. Bottle is marked with ounce gradations. Bottle is made of 100 percent recyclable plastic with 50 percent post-consumer recycled material. Additional Information Tube Length: 9-1/2"